As I continue to do research on the DRD4-7R gene, I can't help but think about my own adventurous experiences and how they relate to the characteristics of the gene. I'm often drawn back to two particular summers filled with adventure, freedom, ability to change plans and go with the flow as needed. I call these time periods "Gypsy Summers". 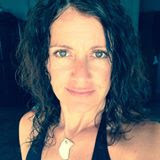 During the summers of 1999 and 2001, I wandered, drifted between jobs, moved between states, lived out of my car, lived in a tent, traveled internationally and hiked a good portion of the Colorado Trail (CT) solo. The name "Gypsy Summer" stems from my father. The three year period between 1999 and 2001 my father often called me his "Gypsy Daughter". He was so right! During the summer of 1999, I backpacked through Europe visiting England, Ireland, France, Italy, Sicily, Greece, Turkey and Switzerland. I started the trip with a good college friend of mine, we decided to explore on our own during the last month of our trip. While on my own, I met fabulous and influential people, learned the way of local cultures, adapted and learned a lot about myself. These experiences will be forever be embedded in my brain. This summer was like a natural high that didn't end for months. My second Gypsy Summer was during the summer of 2001. After teaching science at a Colorado Springs Middle School, I threw my simple belongings into a storage and hit the Colorado Trail (CT). The CT starts just west of Denver, runs 235 miles through the mountains and high country of Colorado, then ends in Durango. The plan was to hike the last 1/3 portion of the CT with a friend from Kansas City, but after the first leg he had pull out in Creede due to severe blisters on his feet. So, I finished the hike to Durango by myself. It was an easy decision and I wasn't afraid one bit. One day while hiking my longest mileage from the Rio Grand River to Silverton, I entered a rain and lightening storm above treeline. The electricity of the lightening surrounded me so close that I could see the hair stand up on my arms. My only thought was "if I die, I will die happy doing something I love". After my trek, I enjoyed bluegrass festivals, camping with my 80 year old grandmother, visiting hot springs, picking mushrooms and driving back and forth between Colorado, Oregon, Washington and the midwest. What a fabulous summer to remember! During these summers, I learned more about myself than all my six years combined in college. Since, I believe everyone should experience a Gypsy Summer, I came up with the TOP 10 REASONS TO EXPERIENCE A GYPSY SUMMER. 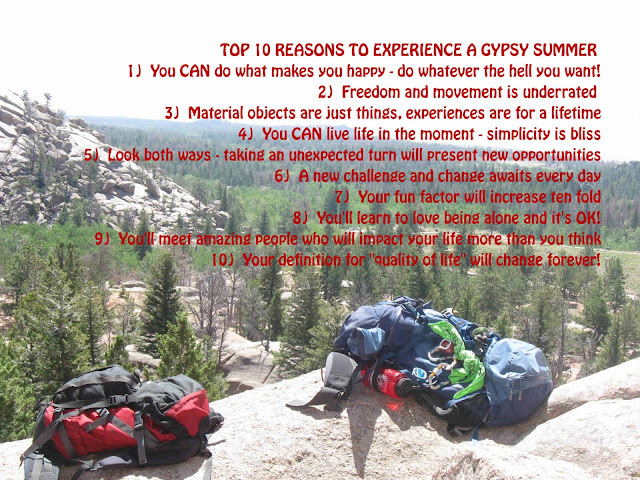 Hopefully, this will give you inspiration to plan your own Gypsy Summer.